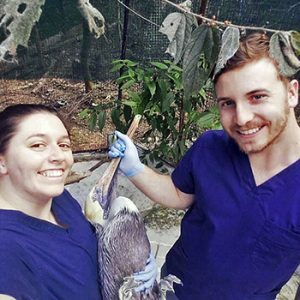 During the final week of winter break this month, two Illinois veterinary students journeyed together to Costa Rica to volunteer for the VIDA IVTC Program. As Megan notes, “Of course, I wish I had had more days for surgery and time after the program to explore Costa Rica on my own, but we were able to fit in this amazing experience without compromising the holidays and seeing family!” Read on for their individual perspectives on the experience. Our trip to Costa Rica with VIDA started off with ease. We were greeted at the airport in 80-degree weather by our amazing driver, Christian, and he brought us to our hostel in the hip, foodie area of Barrio Escalante. We were greeted by the owner of the hostel, and right away the genuinely friendly attitude of Costa Rican culture was evident to my classmate Megan and me. In a way, this trip to San Jose was a business trip. We came to Costa Rica to gain extra surgery experience. When all was said and done, I was able to workup, perform surgery, and recover twelve patients (8 dogs and 4 cats). I finished the week with nine spays and three castrations, literally increasing my experience six-fold from my junior surgery lab as a third-year veterinary student. The surgeons and anesthesiologists we worked with were extremely helpful and walked us through the surgery, step by step. 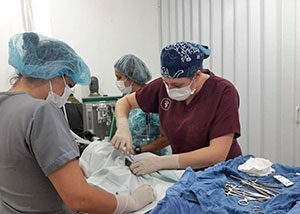 Starting on the afternoon of the first day of surgery, I was doing the procedures by myself, under the trained eye of a shelter medicine surgeon and professor at the national veterinary college of Costa Rica. The knowledge I gained was incredible. and I returned to Illinois much more confident in my surgery skills. We also had a wildlife day at the rehabilitation zoo called “ZooAve.” It was an incredible experience. 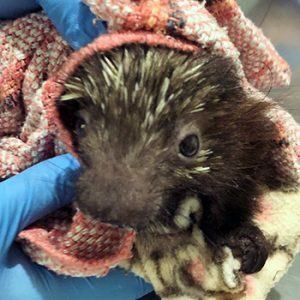 I helped feed and perform a procedure on two baby porcupines named Rice and Beans. I also helped pull blood work on some parrots, and I even was lucky enough to work with a kinkajou and a two-toed sloth suffering from symptoms of electrocution. It was a once-in-a-lifetime experience to work with these animals, and it was a great change of pace from 7 a.m. to 6 p.m. surgery days. At nights we enjoyed delicious, fresh Costa Rican food. The fresh juices were unbelievable and the foodie area we stayed in had dozens of amazing options. We were in the country for a week, and barely scratched the surface of the food options. I would love to go back and continue the foodie experience we started in Barrio Escalante. I knew I’d gain experience from my VIDA trip to Costa Rica, but I didn’t realize I would make new friends. We got along so well with our surgeons and anesthesiologists that they decided to take us out to dinner one night and enjoy a mild night on the town. 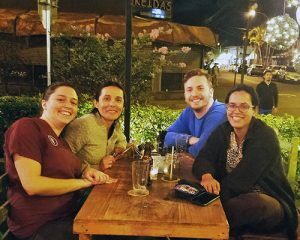 We sat for a few hours, after an eleven-hour day of surgery, and shared personal stories about our lives and many laughs with the Costa Rican doctors. I made lifelong friends, and it just goes to show how close our veterinary community really is: it can cross state lines, country borders, and vast oceans. Costa Rica is a beautiful country, and I am hoping to return one day to venture to the vast beaches and see more of the country. 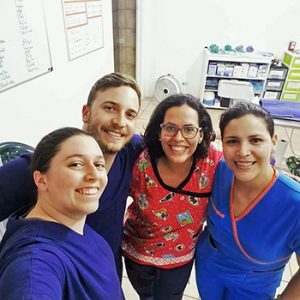 I had an amazing experience doing surgeries in the central Americas, but what I will remember most isn’t the city of San Jose, the delicious food, or even my animal patients, but will be the amazing, genuine people I had the honor to spend time with. #PURAVIDA. Tip for traveling in Costa Rica: Use “pura vida” (translates to “pure life”) for almost anything: “How is your day?” “Pura vida.”; “Thank you.” “Pura vida!” They use it for everything! What makes the IVTC program so special is one-on-one surgeries with a veterinarian to spay and neuter local animals in poor communities. The IVTC program is custom built around your schedule and the veterinarians’ schedules, so you can do as many or as few surgery days as you like! Another special perk of the program is the option to include wildlife days in your schedule. It doesn’t matter if you have never touched a bird, sloth, monkey, or turtle before, Costa Rica is rich in wildlife, and the veterinarians are there to teach and help you get a once-in-a-lifetime experience. I would like to start off by comparing this program to the World Vets program I volunteered with one year earlier. They are both spay and neuter projects; over four clinic days I performed a total of 12 surgeries and completed anesthesia on another 12 patients. Neither program requires you to speak Spanish, and both are located in beautiful countries in Central America. World Vets had a larger group, with pre-vet students and technicians taking care of the intake and placing the anesthetized patient in front of you for surgery. Since I had never done a spay or neuter before, the focus on surgery was appreciated, and I had a veterinarian right on the other side of the table teaching and assisting me. In the VIDA IVTC trip, I performed the intake (physical, drug calculations, prep, etc.) on all of the patients I performed surgery on, yet still had a veterinarian on the other side of the table teaching and assisting me. 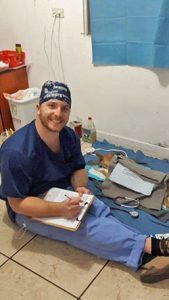 After having experienced the World Vets trip and having started my junior surgery course at Illinois last fall, I felt like I was going through the decision-making process and the actions of a real veterinarian. A big difference from junior surgery was that the dogs and cats in both countries had fleas, but there were a lot more ticks/tick-borne diseases, and TVT (transmissible Venereal Tumor) in Nicaragua than there was in Costa Rica. The IVTC trip can be private or shared with up to three veterinary students, which saves costs for the overall program. I went with a classmate of mine, Judson, but we had differing levels of surgery experience, technical knowledge, and classroom knowledge. Each day we had six patients (a mix of cats and dogs, both males and females) that we split who would be doing the surgery and who would be doing anesthesia. 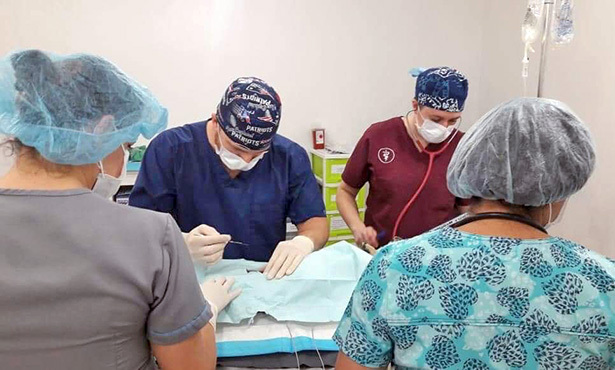 There was a surgical veterinarian and an anesthesia veterinarian to help us with our duties, but as we gained confidence over our four clinic days, we took the reins more, and they took a bigger step back. We worked with different veterinarians over the course of our time there, so we learned different surgical techniques and little tips and tricks for surgery and anesthesia. We had time for only one wildlife day. We were the first IVTC volunteers to go to Zooave, whose veterinarian also works with VIDA part time. Zooave is a zoo, but its animals are acquired after being found hurt in the wild and not being releasable because of injuries, because they are invasive species, or because they had become habituated to human interaction. While we were there we helped the staff get blood on a variety of macaws and parrots, checked in on their patients (one of which was a baby porcupine that needed an enema), and helped with some animals brought in by government workers. The first emergency patient was a kinkajou that climbed a telephone pole and got electrocuted; we helped sedate, administer fluids and medications, and assess its injuries. 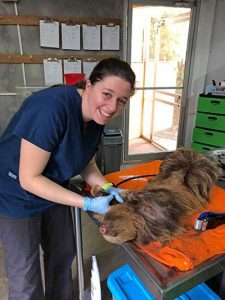 The second patient that came in was a male two-toed sloth that also was electrocuted, so we sedated it, placed a catheter for fluids, and administered medications. The burns did not seem bad, but we learned that in these cases it will take the burn a few days to reveal itself from the inside of the body where the electrical current went, and a limb may need to be amputated if there is extreme damage. The zoo already had a two-toed sloth missing an arm, so the veterinarian suspected that this sloth might also become a permanent resident. The program provided us with transportation from and to the San Jose Airport in Costa Rica, as well as transportation to our clinic orientation day and to the zoo. It also arranged for our stay in a hostel about a 12-minute drive from the clinic. Breakfast was provided by the hostel, and lunch was provided by the program, so we had the opportunity to go out and find dinner ourselves and explore the local cuisine that was in walking distance of our hostel! The hostel had a private room option, and we paid for the upgrade for the week, which was worth it after long surgery days and early mornings. In addition to dinners and the hostel upgrade, the cost of transportation to the clinic on surgery days and the flight were not included in the price of the trip. Overall, I would 100% recommend the IVTC program for veterinary students who are interested in an international surgical experience. Whether it is your first surgery or your fiftieth, there is nothing like an international experience that allows you to help the local pet population and even assist in helping the local wildlife! If you’re interested, go to the VIDA IVTC program and plan your own Costa Rican veterinary adventure!